In Ration Farm Cemetery, La Chapelle- D'Armentieres, Nord France is the Commonwealth War Grave of Lieutenant Philip Anthony Brown, serving with 'B' Company, 13th (Service) Battalion Durham Light Infantry, who died on the 04/11/1915. Philip Anthony Brown was born the 27th January 1886, at 'Hillingdon', Park Road, Beckenham, Kent, the 4th son of Anthony Brown, [born Clapham, Surrey in 1844, died 15th January 1902 at Broomhill], and his wife Jane Chalmers, [born in 1853, Stroud, Gloucestershire, died 10th February 1933], ('Broomhill', 29 Southend Road, Beckenham Kent), daughter of Charles Playne, J.P. for the County of Gloucester. They had 9 children, but one died, [Dorothy Mary, born 1874, Bromley Lodge, Tulse Hill, Surrey]. Theodore Anthony [born 9th July 1889, Beckenham], Charles Anthony [born 1874 Bromley Lodge], Anthony [born 19th February 1881, Beckenham], Denys Anthony [born 1895, Beckenham], and Philip Anthony, Lucette Rose [born 26th, 1875 at 39 Tulse Hill, Brixton, died 1971], Marjorie Chalmers [born 23rd August 1883, Beckenham], and William Anthony [born 23rd April 1879, Beckenham]. In 1881 and 1891 the Brown family were residing at Hillingdon, Park Road, Beckenham. By 1901 they had moved to 'Broomhill' 29 Southend Road, Beckenham. This property was registered with 19 rooms. The Abbey School was just a few houses away from where they lived. Philip was educated at Abbey School, then Malvern College, House Number 6 from 1900 to 1905. Whilst at Malvern, he was the winner of English and Reading prizes. He was a College Prefect, also Editor of the College magazine, 'The Malverian', played for the Football XI, and was in House 6. The 1901 census shows Philip Anthony Brown at Malvern College, in House 6. From Malvern College he went to New College Oxford, (Scholar) on a scholarship to read Literary Humanities. He gained an Open Scholarship in History to New College Oxford, matriculating there in Michaelmas 1905. He failed Moderations in 1906, but went on to gain a 3rd in Classics in Trinity term 1908 and a 1st in History in Trinity term 1909. He was made M.A. in 1912. He moved to Newcastle-upon-Tyne in 1911, and about this time he took a great interest in the education of the working man and woman and became one of the first Tutors for the Workers' Educational Association [WEA], then based at 84 Westmorland Road, Newcastle-upon-Tyne. A working class hero is something to be: Philip Anthony Brown was in charge of classes at Gateshead, Wallsend and West Stanley. Setting aside the offers of a glittering academic career, and the expectations of a privileged background, he dedicated himself to teaching economics and history in the mining towns of Co. Durham before 1914. A brilliant historian, he worked with GDH Cole and RH Tawney, also WEA tutors, on researching and publishing 'history from below', the story of working class and democratic struggles for political liberty and the right to an education. During 1911 when the census was being compiled Philip Anthony Brown was visiting friends at the 'Manor House', Glasshoughton, Castleford, Yorkshire. He was lecturing for the London School of Economics in political history, before starting to Lecture for Hatfield College in Economics, at Durham University in 1912. Philip's father had died in 1902, and the family were still residing at 'Broomhill', 29 Southend Road, Beckenham. including 36 year old, Anthony's older brother Charles Anthony Brown, who was a solicitor, admitted February 1900, practising at 57 Gracechurch Street, London. He joined January 1917, as [a] Cadet, Garrison Officers' Cadet Battalion. Gazetted 2nd Lieutenant 3rd Garrison Battalion, Royal Welch Fusiliers March 1917. Transferred to the 2nd Garrison Battalion in June 1917. Promoted Lieutenant September 1918. Served in Egypt. [Solicitors Record of Service, page 69]. Also Theodore Anthony Brown then aged 21 was residing at this address, [Assistant Manager of a Wholesale Stationery business] with sisters Lucette Rose Brown, age 35, Marjorie C. Brown age 27. Catherine Morten Playne was also residing at this address she was the sister of Mrs Brown. William and Philip had already left this residence address. Mrs Jane Chalmers Brown was a member of the local Parochial Church Council [PCC] St Paul's, for a number of years before her death. In the accounts of the PCC in 1932, she is listed among the subscribers to the Choir Fund, The Floral and Alter Fund, Rochester Diocesan Society and Board of Finance as well as the 1932 Special Appeal. After long debates he joined the army as Private 12351 in 1914, with the 6th Battalion Duke of Cornwall’s Light Infantry rejecting at first the chance of entering the officer class. He was persuaded to take a commission and he obtained a 2nd Lieutenancy on the 13th October in the Durham Light Infantry then promoted to a temporary Lieutenant on the 3rd February 1915. He was also appointed Assistant Adjutant in the 13th (Service) Battalion Durham Light Infantry. Sent to France on the 25th August 1915. 13th (Service) Battalion, was formed at Newcastle in September 1914 as part of K3 and came under orders of 68th Brigade in 23rd Division. Record same as 12th Bn. 14th September 1918 left 23rd Division and returned to France, joining 74th Brigade in 25th Division at St Riquier on the 19th September 1918. Philip wrote many letters to his family. On the 8th of October he wrote:- About 12.30am, a man came and said he could hear moaning over the parapet. I was afraid that this meant that some of my men, who had just started on a listening patrol, had been hit.... I went down with my observer, a very nice Irishman from County Durham, who goes with me everywhere, and crept along a very shallow trench. We soon came on one man down in the bottom of the ditch. It was difficult to move him, but finally my observer got him on his back. Poor fellow had a bad wound in the side. This was the first night of the battalion's first tour of duty in the trenches. The observer was Private Thomas Kenny. The routine of front line duty followed by relief continued for the rest of October, with working parties - digging and wiring - sent out every night, except when it was so wet that all work was cancelled. About 8.30pm on 2nd November, in pouring rain, the 13th Battalion relieved 12 DLI, once again, in the front line trenches numbered 1.26.3-5, opposite La Houssoie, near Armenlieres. The rain continued all the next day, filling the trenches and caving in the parapets and dug-outs, but at least the rain kept the Germans quiet. Philip Brown wrote again to his mother...We have gone back to the trenches - and to such trenches. I don't think any words can adequately describe them. It has been raining..... There is not a patch of dry ground anywhere. Boards soaked in mud, sandbags bursting with mud, ponds and even wells of mud.....yellow mud, greasy ponds, dirty clothes and heaps of' mangled sandbags. A great deal of the trench work is collapsing in the wet, as was to be expected, and it keeps us busy reconstructing it. We had a certain amount of shellfire, but very little rifle fire yet. A mild enemy in front of us, I think. Now I must stop, as I am on duty and should go the rounds. This was his last letter home. At 9.15pm on 4th November 1915, Lieutenant Brown, as the officer of the watch, went out to visit a party working on the barbed wire in front of Trench 1.26.4. He was accompanied, as always, by his observer, Private Thomas Kenny. The rain had stopped, but with no wind, a thick fog covered no-man's-land. In the dark and fog, Lieutenant Brown lost his bearings and missed the working party. The two soldiers went on until they realised that the ground was unfamiliar. They were lost somewhere in no-man's land. They then sat down to listen for any sounds that might direct them back to their own lines and safety. Hearing nothing, they decided to try to retrace their steps through the mud. It was then about 9.45pm. At the moment they rose, a single rifle shot rang out and Lieutenant Brown fell, shot through both thighs. Thomas Kenny at once went to his aid and hoisted Lieutenant Brown onto his back. Immediately, heavy rifle fire opened up from the German lines, forcing Private Kenny to crawl through the mud, but still he kept his badly wounded officer on his back. Lieutenant Brown implored Kenny to leave him, but Private Kenny had replied to the officer: As long as there is life in you I stay by your side and the Lord will protect me and give me strength to get you into our lines. When the bursts of fire were too severe, he lay still, only starting again when the firing slackened. This ordeal lasted for nearly an hour, before Private Kenny, cold, wet and utterly exhausted, at last stumbled upon a ditch he recognised. He made Lieutenant Brown as comfortable as he could and started off to find his battalion's front line. Thomas Kenny arrived at a battalion listening post in Trench 1.26.4 at just after 11pm, and there found Captain White. After he heard Kenny's story, Captain White asked for volunteers to go with him out into no-man's-land. Two stretcher bearers, plus Privates C. Cameron, 16874, Robert Watt, 16706, Ernest McLane, Thomas O. Kerr and Michael Brough volunteered, [last two both from the Stanley area], Sergeant W. Calvert, Corporal R.A. Campion, Private Kenny, despite his exhaustion, his torn uniform and his bleeding hands and legs, then led them to where he had left his wounded officer. As the rescue party started back with Lieutenant Brown for their own lines, German soldiers opened fire with rifles and machine-guns and then grenades were thrown from a position only thirty yards away. Captain White immediately ordered the party to go on, whilst he stayed behind to cover their retreat. Private Robert Watt from West Hartlepool was killed, [remembered on W111.55], and Ernest McLane from Middlesbrough died from wounds. Once back in the battalion's trenches, Philip Brown, despite his terrible wounds and weak from loss of blood, recovered consciousness for a short time and was heard to say Well, Kenny, you're a hero. He died 4th November 1915 whilst he was being carried back to the dressing station. [Private Kenny was heartbroken to hear that Lt Brown had died two hours after reaching safety]. The Colonel wrote: He was the most popular officer with both men and officers in the regiment, and his platoon were so angry that they could with difficulty be restrained from going out then and there to avenge his death. The London Gazette announced the award of the Victoria Cross to Private Thomas Kenny, on 7th December 1915, stating that his pluck, endurance and devotion to duty were beyond praise. [Citation] He was the first soldier of The Durham Light Infantry to gain this award during World War One. On 4th March 1916, Lance Sergeant Thomas Kenny was presented with the Victoria Cross by King George V at Buckingham Palace. Mrs. Brown, the mother of Philip Brown, was there to meet the man who had tried so hard and for so long to save her son's life. Philip's mother had written an account about going to Buckingham Palace and meeting Private Kenny. (See below), Also in the letter Sergeant [his rank now] Kenny explains what he did to help Lieutenant Brown. Mrs Brown took Kenny to her son's old school Abbey School, and they went back to her home in 29 Southend Road, Beckenham, to have tea. The Durham Chronicle and Seaham Weekly News 3/12/1948 reports Kenny's death. It tells how, on leaving Buckingham Palace after receiving the V.C. from the King, he met a lady at the gates, who was Lieut. Brown's mother. They kept up a regular correspondence and every year, on the anniversary of the deed, Mr. Kenny received a gift of money from her. After she died, her daughter, now living in Canada, kept up the payments, the last one arriving just a month before Mr. Kenny's death. Lieutenant Philip Anthony Brown left a will, leaving effects of £4832 11s 4d to his widowed mother. He also left £200 to the District and an equal sum to the Central Office. The interest on Brown's bequest was to be used for grants for summer school students. A memorial appeal was launched and raised £111. This was used partly to furnish and decorate new office premises in the Royal Arcade in 1918. The District Offices, [two rooms above a co-op shop] had been at 84 Westmorland Road in Newcastle-upon-Tyne. This was rented from the N.E. Cooperative Society for £6 a year. Newcastle Journal 13th December 1915, carried a report under the heading Educational Association.A meeting of the members of the North-Eastern District Council of the Workers' Educational Association was held on Saturday, at the Burt Hall, Newcastle. Dr Jevons presiding over a large gathering. Mr J. G. Trevena, district secretary, intimated that, in accordance with a suggestion made at the summer school at Bowes that a re-union should be arranged in January, he was glad to state that they had been successful, through the kindness of Dr Jevons, in obtaining part of Hatfield Hall for the weekend January 14-15-16. The terms would be 6s per day or 12s for two days. Friday evening to Sunday evening. The charge for the Saturday only from midday would be 4s. The Chairman alluded to the memorial of the late Lieut. P. A Brown. The deceased officer was a prominent and useful member of the association. When war broke out he enlisted, and afterwards was given a commission. He died in the execution of his duty at the Front, after a gallant rescue had been made by Private Kenny of Wingate. Dr Jevons read an article describing how Lieut. Brown met his death, and the gallant act of Kenny, which won for the latter, the Victoria Cross. Lieut. Brown was one of the most lovable men he had ever met, something of an educational kind, which would have met with the approval of their dead friend. Dr Jevons read a letter which it was suggested should be sent to the branches, inviting subscriptions towards the memorial. The proposal to proceed with a memorial was confirmed by the council, and it also agreed to send a letter of congratulation to Private Kenny upon his gallant deed. Oxford University Roll of Honour New college entry:- 1905 Brown, P. A., M.A. (Sept. 1, 1914). +Lt. 13th Durham L.I. France. Killed in action near Armentieres on Nov.4, 1915. Philip Anthony Brown also wrote a book called 'The influence of the French Revolution on English History' it was published after his death, also English economic history. Beckenham Journal - dated 13th November 1915 Brown - Killed in Action on November 4th, Lieut. 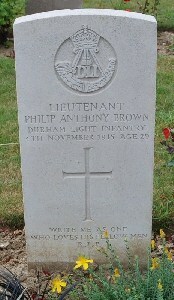 Philip Anthony Brown, 13th Batt. Durham Light Infantry, fourth son of the late Anthony Brown and Jane Chalmers Brown, of "Broomhill," Beckenham, aged 29 years. Lieut. Philip Anthony Brown, 13th Battalion, Durham Light Infantry, who is reported killed in action in France on November 4th, was the fourth son of the late Anthony Brown, of Broomhill, Beckenham, and was 29 years of age. He was educated at the Abbey School (Beckenham), Malvern, and New College, Oxford, where he held a scholarship. He obtained a first-class in the final school of Modern History. He took up literary work, and was also the Lecturer in Economics at Durham University and a tutor in the Workers’ Educational Association. Shortly after the outbreak of the war he enlisted in the 6th Duke of Cornwall’s Light Infantry, and obtained his commission in the 13th Durhams in October of last year. He was promoted in February, 1915, and became assistant adjutant. There were plans to raise a permanent memorial, and a committee representing both the University and the Workers Educational Association has now issued an appeal. The Memorial will take the form of a fund to provide bursaries in connection with the Summer School for members of the tutorial classes among which so much of his work is done. Mrs Brown left a will with effects to the value of £17.578 3s 5d. At Bonhams Auctioneers LOT nu 246 was a pair of Officers Memorial plagues, Sold for £223.00. Thanks to University of Durham. Footnote: There is a possibility that Lieutenant Brown was buried by the Reverend Herbert Butler Cowl, who was an army chaplain. For the full story read The Half Shilling Curate, published by Helion publishing. The Half-Shilling Curate, as he was affectionately known by his family, tells the very personal story of an army chaplain - The Reverend Herbert Butler Cowl - from Christmas Eve 1914 to the end of hostilities in 1919. His descriptive account, from his own personal letters and writings, illustrates the value of faith during the war and the balance between serving God and carrying out his duties as a captain in the British Army. Herbert's engaging story told of the man who matured from humble Christian beginnings to the start of his journey discovering faith, love and a sense of duty and moral responsibility. At the outbreak of war, he volunteered to become a Wesleyan Army Chaplain. With meticulous detail, the reader is taken on Herbert's journey with the Durham Light Infantry from the objective view of life in the Army Home Camp in Aldershot, to the adventure of France and the reality of Flanders on the Western Front near Armentières. Whilst serving at the front, his service was cut short when he was severely wounded during heavy enemy bombardment at the front. On his journey back to England, he was placed in a cot bed aboard the hospital ship Anglia when she hit a German mine in the Channel. As a result of Herbert's actions on that fateful day, he became one of the first Wesleyan Army Chaplains to receive the Military Cross for exemplary gallantry. His second battle was recovery - and although he was never fit enough to return to overseas duties, he returned to work as an Army Chaplain in the army garrisons and home camps in England. The book gives an insight into day-to-day life and the strains of service as an Army Chaplain on the Home Front at Colchester and Portsmouth. Twenty years later, Herbert - a Methodist minister with a family living in Acton - found himself in the centre of another battle: the Second World War. As he stayed in London through the London Blitz, again the reader gains an understanding of one man's faith during war and the comparisons that can be seen for a new generation. Herbert's story concludes with the final chapter of his life and the intimate observations of a spiritual man driven to follow his faith during war. Foreword written by Hugh Pym, BBC Health Editor. Philip Anthony Brown is remembered at Newcastle on NUT237 at Durham in D47.013d page 305, on D47.024, in D47.151 page 13 and also in the University of Durham March 1916, Journal.